Well not much blogging has happened lately because our little life has fallen into a new routine. A very busy routine where it doesn’t feel like we do much that is blog-worthy…but I’ll work on fitting it into the routine…or just blog about the routine. Anyways…This was our first Valentine’s day as a married couple *woot woot*. 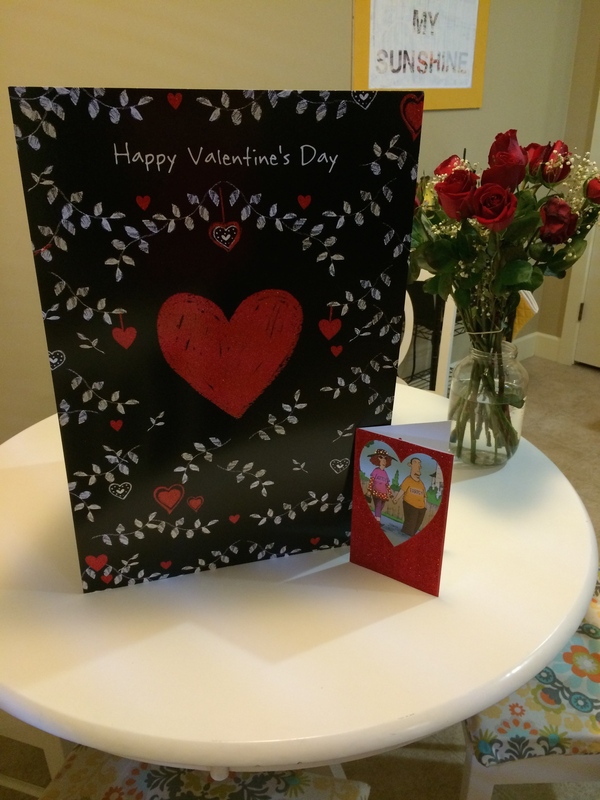 This weekend we had some fun family stuff going on, so we knew ahead of time we weren’t going to be having any romantic candlelight dinners for two or anything…but T surprised me on Thursday night with some roses and a card awwwwwwwwwwwwwww….. Flowers just make me happy…cute husband handing me flowers makes me smile like a sheepish girl who just bumped into her crush in the hallway or something. And just to explain the world’s largest card… we have this debate about who loves whom more (totes obvs I love him more…) but I guess this card earns him winning rights for the weekend. Also, I guess we forgot to register for a vase when we got married…so my roses found a home in a pickle jar. Newlywed life sure is classy. So happy belated Valentine’s Day. Hope you are all feeling the love!